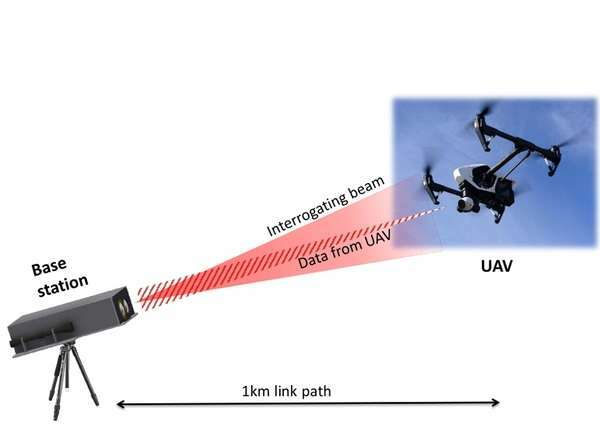 A tracking system called HYPERION based on eye-safe lasers could enable aircraft, UAVs and even orbiting satellites to transmit vital data to ground stations more securely, quickly and efficiently. The development of HYPERION has been pioneered by a joint team through Innovate UK's HITEA programme: the University of Oxford with funding from the EPSRC, and Airbus Group Innovations with Innovate UK support. A proof-of-concept system has now been successfully tested in-flight. The range of the system is currently 1km but work to extend this range is underway. Offering major benefits compared with the traditional RF data transmission systems currently relied on in the UAV sector, HYPERION could for example allow UAVs engaged in disaster monitoring, surveying, search and rescue and other humanitarian missions to send detailed images more rapidly back to the ground for analysis. It could also enable airliners of the future to offload huge amounts of technical and performance data gathered by sophisticated on-board sensors to ground crews during final approach to an airport, speeding up maintenance procedures and cutting turn-round times. Professor Philip Nelson, Chief Executive of EPSRC said: "This EPSRC funded research is leading to exciting developments in aerospace and communications. It will potentially make aircraft and unmanned vehicles better connected and more resilient to outside interference." This optical system aims a laser with a wavelength of 1550 nanometres up from the ground towards the target aircraft, which is equipped with a specially designed reflector that captures the beam, modifies it with the data to be transmitted and then sends it back to the ground where it can be decoded and 'read'. With its optimised aircraft tracking capability and secure high-speed data link, HYPERION offers key advantages over RF communications which are potentially vulnerable to interception and jamming and rely on an increasingly crowded part of the electromagnetic spectrum. Unless alternatives are developed that can supplement radio communications, it simply will not be possible to cope with the huge volumes of data that need to be transmitted from the skies in years in come. Professor Dominic O'Brien, who has led the Oxford team, says: "HYPERION has the potential to enable extremely lightweight, low-power data terminals for UAVs, allowing flight-time to be extended, or smaller aircraft with enhanced capabilities." Yoann Thueux, Research Team Leader at Airbus Group Innovations, says: "HYPERION has clear potential to develop into a technology solution addressing the requirements of UAV operators, who need real-time access to increasing amounts of mission data for surveillance, agriculture and disaster relief. HYPERION could also address the needs of the space sector, by allowing data download from microsatellites in low Earth orbit." John Laughlin, Aerospace Programme Lead at Innovate UK says "High bandwidth rapid transfer of aircraft data allows more efficient operation, new services and safer travel. Collaboration such as these between industry and academia to develop new disruptive solutions to existing challenges are essential to the success of the UK aerospace sector." It is hoped that, with further development, HYPERION could potentially begin to be introduced into commercial use within around 3-5 years.